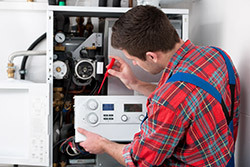 When you need to have a gas line replaced, it’s crucial to call a professional. Gas line replacement is dangerous when you don’t have the right training, knowledge and tools, and trying to tackle this specialized project on your own could lead to disaster. At G.T. Campbell Plumbing, we offer professional gas line replacement in Webster NY services, and we are here to help anytime you’re having trouble with the gas lines on your property or inside your home. If you have any reason to believe that you may have a gas leak, evacuate the area immediately and contact a licensed plumber in Webster NY. Do not use your cell phone until you’ve evacuated the area, and don’t turn any appliances or electronic devices on or off in the area where you may have a leak. Doing so could cause a spark capable of igniting the gas. At G.T. Campbell Plumbing, we have licensed plumbers on call 24/7 to deal with emergencies like gas leaks. We offer dependable and affordable gas line replacement in Webster NY services, and you can count on us to find leaks and correct them as quickly as possible. We have the knowledge equipment to handle gas leaks and gas line replacement both inside your home and on your property, and you can trust our technicians to get the job done right. If you have a gas leak, don’t wait; contact the Webster gas line replacement experts at G.T. Campbell.